I had the urge to write Passion Play for a number of reasons. John Feinstein's best-seller, A Season on the Brink, had established a template for covering a college basketball season from the inside. Purdue had a promising team in the 1987-88 season, one that had tied Indiana for the Big Ten title the previous season, and had a legitimate chance of reaching the Final Four – and, if a lightning bolt struck, winning a national title. Most of all, I wanted the challenge of writing a book. I'd been a professional sports writer for a decade at this point, and it seemed the right time. I did not plan to imitate Feinstein's book, however. His focused on Bob Knight. 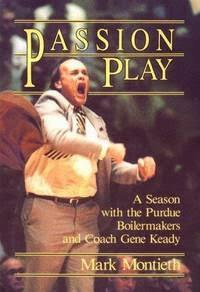 I knew Gene Keady was a far less controversial character, and wanted to dig into the lives of the players as well. Reading it again now, I believe it gives an insightful view into the world of major college basketball in this era, one that can stand the test of time. Keady didn't hesitate when I asked if he would grant complete access for this project -- a tribute to the cleanliness of his program, his cooperative nature and his desire for exposure. I attended all the coaches' meetings, every practice and team meeting, and was in the locker room and on the bench for every game. Not many coaches would dare allow that. Although Keady occasionally joked about reading the manuscript before it was published, he didn't. Nor did he ever try to censor me. He would occasionally preface a comment in a coaches' meeting by saying, "Don't put this in the book Mark, but ...” He then would say something irrelevant to the point of the book anyway, some form of mild venting typical of anyone in a stressful work environment. I did hold back a few details that might have made for interesting reading, to protect the careers of assistant coaches or avoid embarrassment for a player. They were so open with me that I was able to accurately portray their college basketball experience without telling absolutely everything about their lives. I can assure you, however, I hid nothing even approaching scandalous. I believe Purdue's program at this time was as clean as any in the country. I believe it is today as well, having spent considerable time with Matt Painter's program. I realize most fans would gladly trade morals for a national championship, but they can take pride in this much, at least. My experience following this season's team and writing this book was a great one. Craig Klugman, editor of the Fort Wayne Journal-Gazette, generously gave me a leave of absence from covering college basketball to write it. He allowed me to be paid half of my regular salary in exchange for writing a Sunday column each week, which enabled me to survive. I rented out my condo in Indianapolis (from where I worked for the Journal-Gazette), rented an apartment in West Lafayette, and followed the team every step of the way. I was about 12 years older than the players at the time, so it wasn't difficult to interact with them. But my stock answer whenever asked the biggest surprise of the experience was that I was reminded how young they were. They were still “kids” in many ways, on the cusp of adulthood, and it showed on several occasions. I developed a greater appreciation for kids that age who are thrust onto a national stage and scrutinized so carefully. It's an even more difficult environment today. The media is a greater force than in 1988, particularly the “social” part of it. After more than 20 years of other journalistic adventures, I attempted to re-create Passion Play by spending not one, but two, seasons with Purdue's team. The group heading into the 2010-11 season had a chance to do great things, and bore many similarities to the one from 1987-88. Matt Painter, who had read this book as a high school recruit, agreed to give me total access, just as Keady had done. I moved to Lafayette – into Keady's house, in fact, which was empty while he was in New York, working on Steve Lavin's coaching staff at St. John's. I paid rent, kept the house from sitting empty and was regaled by conversation with his housekeeper, Margie. Only problem was, Robbie Hummel blew out his knee on the first day of practice, destroying that team's chance to get to the Final Four before the season began. I didn't want to bail on the project, however, in case the team pulled off some kind of miracle without Hummel. I then decided to return the following season after Hummel returned, in case there was a great comeback story to tell. Both of the Purdue teams I followed lost in the second round of the NCAA tournament, however. They didn't offer much sales potential for a book, and other issues complicated my ability to write it. I still hope to get a book out of those two years of my life, with a broader perspective, much as I plan to give a broader perspective to the team in Passion Play as time goes on. Meanwhile, I appreciate the opportunity to refresh this book. I have edited it, added footnotes and restored lost passages. The book was written in a rush to meet a June deadline, so it read like a rough draft to me. I had recorded all the meetings, locker room scenes and individual conversations on cassette tapes, and it took a month for me just to sift through them and take out what I needed for the book. You like to think when you get away from newspapers for awhile that you're escaping the pressure of deadlines, but this was the biggest deadline I had ever encountered. I had signed a contract to write the book, and it simply had to be done in time to hit bookstores by the following October. I remember Steve Scheffler saying once during the season, “Man, a book! That sounds like one giant term paper.” He was right. One giant term paper, hanging over my head for months. I hibernated in my apartment and wrote every day. I'm a night person by nature, so my schedule evolved into an overnight shift. I would write from early in the evening until about 6 a.m. I'd then read the morning newspaper, go to bed, and get up sometime mid-afternoon. I'd eat, catch up on the necessities of life for a few hours, and then go back to writing. The weather in the summer of 1988 was brutal – a prolonged drought, with consistent 90-degree temperatures. That made it more difficult to get out and exercise, but easier to stay indoors. I got a serious case of cabin fever, though. I recall nights when I fell asleep at my desk. I think any author will tell you, writing a book isn't fun. When the first copies hit my doorstep back in Indianapolis in September, I hardly wanted to look at it; I was still burned out from writing the damn thing. Now, of course, I'm happy I did it. It seems I've lived a few professional lifetimes since then, but I'll always remember what I did in 1988. The book will always be there (or here!) for someone to read if they're interested. I've often thought it would be fascinating today to read an insider's account of a college basketball season from long ago decades, even back to the 1930s. Human stories are human stories, no matter the era. Hopefully this one will be of interest to future generations. A lot has changed since it was written, but human nature has not. Passion Play sold well, nearly 19,000 copies. It wasn't a national best-seller, but it was a commercial and artistic success, if all the positive reviews are to be believed. Beyond that, the experience greatly enhanced my knowledge of the game and all that goes into it, as well as my network of acquaintances. I don't see or talk with the players or coaches from this team often, but when I do, it's like old times. I recorded One on One episodes with Keady, Troy Lewis and Scheffler, and while I knew most of the answers to the questions I asked, I still enjoyed the conversation. The years dissolve when you renew acquaintances with someone you knew well. Reviving the book for this website has been time-consuming and expensive, but at least now I can get it the way I wanted it to be all along. I bought a home computer in December of 1987 on which to write it, back when such devices cost about $2,000. I put most of the chapters on the old 5¼-inch floppy disks and mailed them to the publisher in Chicago, but it wasn't yet equipped to use them. I wound up printing them out and mailing them, a chapter at a time. Someone at that end re-typed them into its processing system, and inserted some typographical errors. That was maddening, but they were corrected for the book's second printing. I don't know anyone today with a computer that can access 5¼-inch floppies any more than I know someone with a black and white television set, so I had to mail the floppies to a company in California to be put on a flash drive. Not all of the chapters could be read, however, so I had to purchase a software program and scan them a page at a time. During this process, I was reminded how much had been cut from the book – scenes from the weight room, the swimming pool, coaches meetings, and the recruiting process. They weren't deleted because they were boring or unnecessary, but because the publisher didn't want the book to be longer than the 327 pages it turned out to be. They wanted to keep production costs down, but I also believe they didn't want my book to look encyclopedic compared to the one they were publishing simultaneously on Michigan coach Bill Frieder, which was a straightforward biography and much shorter. I have restored all deleted scenes. This version is longer by three chapters, including a chapter of fan mail that did not appear in the book. I thought it was fascinating to see how the public responded to a college basketball team, but it turned out to be a luxury the publisher couldn't afford. In short, this version of the book is longer, tidied up a little, and provides updates. Bottom line, it's better. There's a little more passion, and it plays longer. Twenty-seven years later, all of the players and coaches from this Purdue team are alive and well, with one notable exception. Tom Reiter passed away from leukemia in January of 2014, a devastating blow to Purdue's athletic department and everyone who knew him. I had grown closer to him than anyone during this project, because he and his wife, Stacie, reached out to me. I went to their home for dinner a few times, and visited on other occasions. Tom and I were music lovers, although his tastes were more eclectic than mine, and we exchanged cassette tapes. He even purchased a reel-to-reel tape deck that my uncle had owned to record music to play at home. One Saturday evening, while I was deep in the throes of writing, he and Bruce Weber dropped in with a pizza. He also helped me load up a rental truck and move back to Indianapolis after I finished, without my asking. He was that kind of guy. We continued to stay in touch after Tom became the head coach at Washington and Jefferson, a Division III program in Pennsylvania, from 1993-2002. He gave Painter his first coaching opportunity there, as an unpaid assistant. Tom then returned to Purdue as an associate athletic director, a role for which he was ideally suited. He had been a coach, and was therefore the perfect middle man between Purdue's coaches and athletic director Morgan Burke. He could help Burke understand what was going on with a team, and help keep the coaches calm after losses. He possessed the power of objectivity, the ability to view things logically rather than emotionally. He also had been instrumental in bringing Painter to Purdue, and then in keeping Painter there when Painter nearly took Missouri's offer in 2011. After I heard he was battling cancer, I called him one afternoon during the summer of 2013. We talked for an hour, which was easy to do with him. He seemed on the road to recovery then, and was ready to go back to work. He did, for awhile. But about six months later he was gone, just 61. Hopefully you can get a sense of him from these pages. One of the recovered scenes is one of my absolute favorites – the afternoon in the weight room before the game at Wisconsin when he revived the players' flagging spirits, as told in the Answered Prayers chapter. It stands as a fitting tribute to him. I plan to provide constant updates on many of the people in this book, to bring readers up to date on their lives and to get their current-day perspective of this season. It will be a living document, unbound by time and bookbinders. Life brings unexpected turns for everyone, and these characters are no exception. I look forward to continuing to follow their lives. I hired a photographer, David Umberger, to shoot exclusive photos for the book. He also was allowed locker room access. All photographs shown here are his, unless otherwise noted. I have a limited number of hard copies of Passion Play available for sale. About two years after it was released, I bought the remaining copies from the publishing company in Chicago. I couldn’t stand to see them destroyed and I thought I could sell them by various means, so I had them trucked to my home. I sold many of them, and have fewer than 100 left. I’ll mail a copy to you for $12, postage and handling included. The book retailed in 1988 for $16.95, so it’s a bargain. I’ll sign it for you if you don’t mind the instant depreciation. Send a check or money order to Halfcourt Press; P.O. Box 346; Fishers, IN; 46038, or buy now online by clicking the button below. When you click the Buy Now button below you will be taken to PayPal.com to complete the transaction. A PayPal account is not necessary; just choose the “Pay with Debit or Credit Card” option.